© Operation RubyThroat & Bill Hilton Jr.
Ruby-throated Hummingbirds (Archilochus colubris) are the most widely distributed of the world's 339 species of hummingbirds, all of which occur ONLY in the Western Hemisphere. For more information about this bird's amazing natural history, begin by clicking on the first topic below. 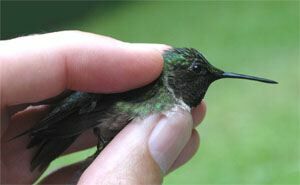 For information about bird banding results, go to Hummingbird Banding.